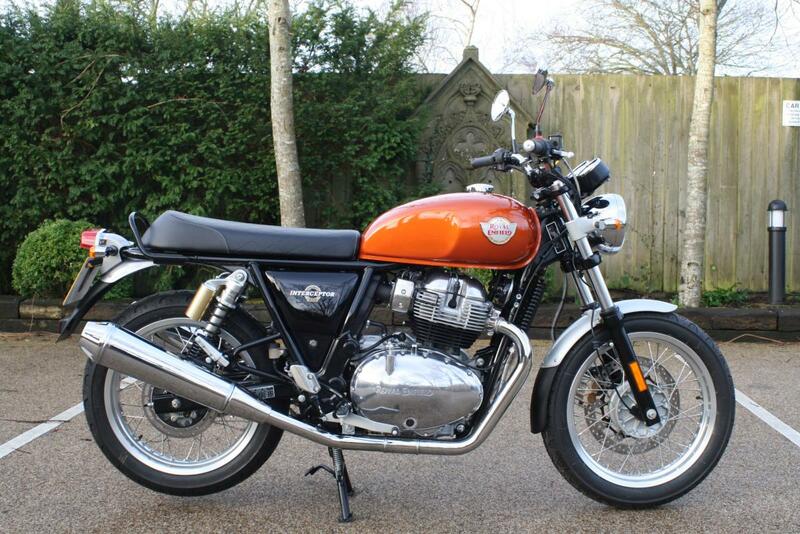 We are thrilled to be able to offer you the fantastic Royal Enfield Interceptor 650 Twin. Stunning bike, fantastic value and a superb all rounder. The middleweight market better shape up with the Royal Enfield 650 twin in town; this air-oil-cooled engine is a peach. Easy to use and easy-to-tame with enough low-down grunt for an A2-friendly machine. Skipping around the slower roads or even cities will be a much happier experience on a bike like this, which then begs for revs and a full roll of the right wrist when on out in the open. It’s a big roll too. RE are using a 6-speed gearbox for the first time and it’s a good one, with a neat, precise and barely audible clunk each time a new gear is selected. A slip assist clutch allows for quicker, smoother down shifts without locking the rear wheel as well as a lighter clutch action. The overall feel of the engine, from the sound to the fueling, throttle action, seamless power delivery and beyond is impressive. A twin exhaust up-swept set-up splayed out either side of the rear 18” wheel sanctions the mind to assume it’s a larger capacity machine. Allowing the engine to bellow its typically twin burble is a job well done, the soundtrack is a real highlight. When brimmed, the 13.7-litre fuel tank will take you beyond 150-miles. The riding position is spot-on with an 804mm high seat which is narrow enough at the waist to make getting on and off simple and standing flat-footed not a problem for the shorter among us. A diamond quilt-pattern stitched seat fits the bill as far as the 60s retro aesthetics go but isn’t so easy from a practical perspective after 30-miles or so. A wide set of bars once again add to the charm and the vibe. The large yet non-adjustable front brake lever is set slightly too high for my preference but with a slip-assist clutch lurking beneath, at least the clutch action is light enough. Best of all we can offer Low Rate Finance on this bike, credit subject to acceptance. For a no obligation finance quote, please call 01747 811196 and select option 1 for sales. Thank for looking! !